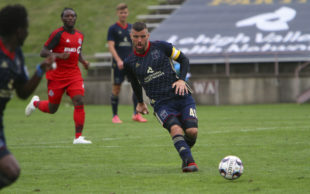 Facing a must win game against the team with the fewest points in the USL’s eastern conference, playoff hopefuls Bethlehem Steel laid down a decisive marker to their conference rivals with a 4-0 clean sheet against Toronto FC II Saturday afternoon at home. As the match’s first minute was ending, Bethlehem left back Prosper Chiluya lanced a deep penetrating pass to Faris who successfully turned his man and out ran him to score 61 seconds after the referee had whistled the start. It was the fastest goal in Steel FC’s history. A comparatively even match ensued for the rest of the half. Bethlehem was on the front foot, outpacing Toronto for all but the middle five minutes. But Toronto was dangerous on the counterattack. Possession statistics were even, and Toronto outshot Bethlehem 8-6, although Bethlehem had two shots on frame to Toronto’s one. The only first half statistic that was not even was corner kicks, Bethlehem had six to Toronto’s loner. in the 44th James Chambers missed a wide-open goal on a superb feed from Aaronson. The second half saw Bethlehem’s well-rested high pressure rip Toronto apart as they ran rampant. In the 56th Mahoney was taken down in the box by Toronto left back Terique Mohammed for a penalty kick that was powered home by Chambers. And in the 75th, 28 seconds after he had subbed onto the pitch for Faris, Chris Nanco scored an easy one on a feed from Ngalina. There were a handful of other second half chances that might have been. If Faris had better luck he could have had a hat trick, and Moar could have had a brace. Bethlehem’s high pressure was relentless all over the field for the entire game, reflecting Burke’s emphasis on conditioning over the 15-day break. Toronto handled it well for the first 20 minutes but then began to wilt and were thoroughly done by the 60th when they began to substitute. Everyone contributed mightily, but Prosper Chiluya and Anthony Fontana seemed defensive standouts. Toronto striker Ayo Akinola is no longer a boy. When he learns to put his shots on frame, he will be a dangerous striker. And late sub striker/winger Shaan Hundal has a marvelously quick change of pace to go with his speed. In the official “points won” eastern conference table, Bethlehem lie fifth, tied with Indy on points at 45 but ahead on the first tie-breaker, total wins. Indy have a game in hand and two tough away games to Cincinnati and Louisville. They host surging Tampa Bay and the Steel in two weeks. Red Bulls 2 are within three points of a tie but has yet to win on the road — three of their remaining four — and finish by hosting Pittsburgh. Ottawa, North Carolina, Tampa, and Nashville are all within five points, and most have games in hand on Bethlehem even now after their 15-day layoff. The race for fifth through eighth is tight. Bethlehem next plays Sunday, September 30th away in Ottawa against the Fury at 1:00 PM. Following that they are away to Indy Eleven Saturday, October 6th at 7:00 PM. And they finish Sunday, October 14th by hosting Tampa Bay at 3:00 PM. All three games are “six pointers” in their playoff race. Series finale: Toronto FC II is moving to the newly-starting USL Division 3 league next season, so Saturday’s game was their last with Bethlehem for the foreseeable future. Toronto’s departure – along with Orlando’s and Richmond’s – for a less challenging competitive milieu indicates the success coaches Hogan, Coleman and Burke, and talent spotters Albright, Stewart, Tanner, Wilson, Kone and others have achieved in an increasingly difficult competitive environment. Youth: The average age of Bethlehem’s starting lineup, 21.8, was lower than that of the team thought to be the youngest in the league, Toronto 2, 22.36. Anthony Fontana starting at center midfield dropped Bethlehem below the Canadians. Records: In addition to the already-broken club record for goals scored in a season (54 and counting), Bethlehem has its most wins ever with 13 and its most wins at home with seven. Bethlehem Steel is the only team to have kept clean sheets against Toronto FC 2 since Pittsburgh did it on August 4th. Toronto had been on a scoring tear with 16 goals in the six game sandwich between Bethlehem’s clean sheets. Those who are surprised that the first team did not send new striker Kacper Przybylko down to Bethlehem for a medical rehab start have not realized his deal was completed after the USL roster freeze date. The German might be on the bench for the Union against Sporting KC in any case. Toronto: Caleb Patterson-Sewell ©; Tim Kubel, Kyle Bjornethun (Shaan Hundal 79’), Robert Boskovic, Terique Mohammed; Nobel Okello Ayo, Liam Fraser; Ryan Telfer (Malyk Hamilton 59’), Mathew Srbely, Tsubasa Endoh (Jordan Faria 61’); Ayo Akinola. Unused Substitutes: Borja Angoitia; Dante Campbell, Malik Johnson.